After the Pocket integration earlier this week, I've cooked up or landed a couple more patches. Those darn mailman administrator passwords. There's no "forgot password" button and the password is shared amongst all the administrators of a mailing-list. Now Epiphany remembers them and I don't need to go through my inbox trying to recover them. Epiphany was using Totem's glow button, a button which glows a couple of times to bring your attention to it. It's used in Totem's browser plugin, to show that it's ready to play, and Epiphany to show finished downloads. It broke due to GTK+ changes, and it's now reimplemented using CSS animations instead of horrible hacks. A little privacy hack, inspired by the PureURL Firefox extension. This removes tracking information from URLs when tracking is disabled in the preferences. In your applications, you might have to deal with compressed files: ISO images of installers, e-book or e-comic types based on ZIP files, video DVD images. libarchive makes things easier by allowing you not to have to deal with external commands to extract those few files you care about. The API feels a bit antiquated, compared to using GLib/GIO for files handling, but it's generally easier than dealing with potential security issues launching external tools, or even dealing with shell argv quoting. totem-pl-parser uses libarchive to determine what type of video disc image are hidden inside an ISO image. 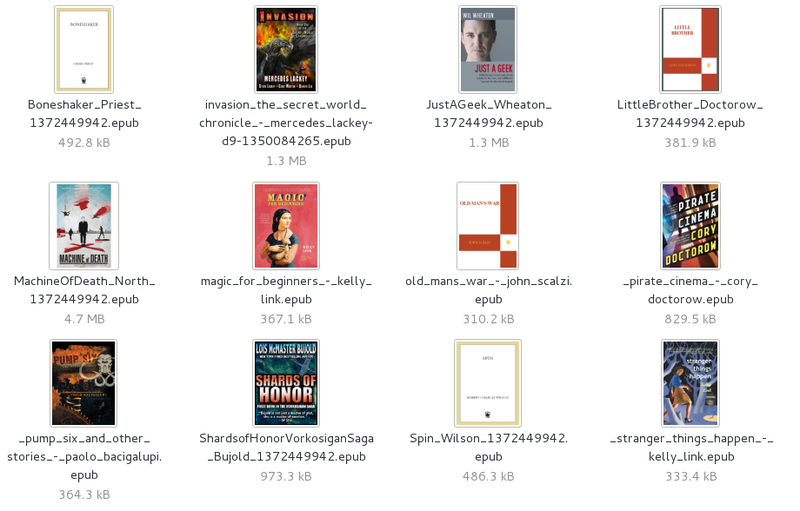 gnome-epub-thumbnailer (as well as its siblings, the Krita and OpenRaster thumbnailers I talked about more recently) uses the ZIP handling to extract particular files, and figure out which file is the cover image. 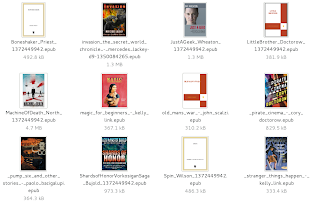 Boxes could use libarchive to extract files from ISO images for its auto-installer, evince could use it to handle CBZ e-comics. There's a couple of limitations though. ISO support doesn't handle UDF images (which just means weird filenames, not inaccessible files), and RAR support is still quite young. I hope that this post can spur on bug fixes for the RAR support, new UDF support, or even a GIO-style wrapper around the library. The upstream authors have been particularly good at fixing bugs that only showed themselves with broken files, and I'd like to thank them for their very useful work. I'm a big fan of Pocket, the "Read Later" service. I regularly save blog posts, videos, tweets and articles to read later, and then consume them on my iPad 1 (I hope they don't cut off the old app yet), my phone, or using the Kobo e-book reader. The first step was writing the GNOME Online Accounts support for Pocket accounts. This isn't quite finished, and there was some ugliness due to the way Pocket's authentication works. It's not complicated, but it's neither OAuth 1, nor OAuth 2. The patch also adds a new type of service that you can toggle on/off in the settings, see about that below. I don't really read articles on my laptop, and I'm Linux-tablet-less (the WeTab you might remember is now with gnome-shell developer Florian Müllner). So my main concern was saving articles to the service. The UI is still a bit in flux, but this is what it looks like on my machine right now. In the future, we might want to try and show the status of the page (has it already been saved?) or a way to edit tags after having added the page. There are other services similar to Pocket, such as Instapaper, or even the free and open source Poche. The good news is that adding support for those services should be easier, as you'd only need to add a new gnome-online-accounts backend, and write a little bit of backend code in Epiphany (eg. 2 out of the 4 steps in adding support for Pocket). The infrastructure is, or more accurately, will soon be there. Update: The Epiphany/Web bug for the browser integration is here. Doh! There's now a Krita and OpenRaster/MyPaint thumbnailer in GNOME git, and as tarball releases. My ISP, Free, gives its customers an access point and TV set-top box. The access point is also a UPnP, Samba, AFP server and Bittorrent client amongst other things. It's also responsible for handling IPTV, streaming to the TV set-top box. You can also watch TV on your laptop streaming RTSP to local clients. This Grilo plugin, once all the issues are fixed, should allow us to show the TV channels in Totem. Another week, another panel refresh. 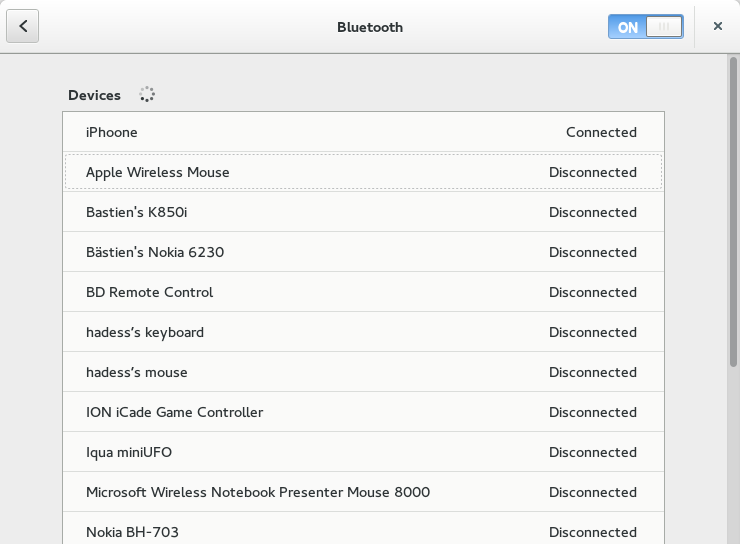 Rather than the 2-pane approach, and a separate setup interface we used to have, we've gone for a single pane device list, as you've probably seen on your smartphone. We also do away with the "Discoverable" switch (your computer will be visible when this panel is opened, invisible if not), and nearby devices will show up at the bottom of the list. Simply click on one to set it up. 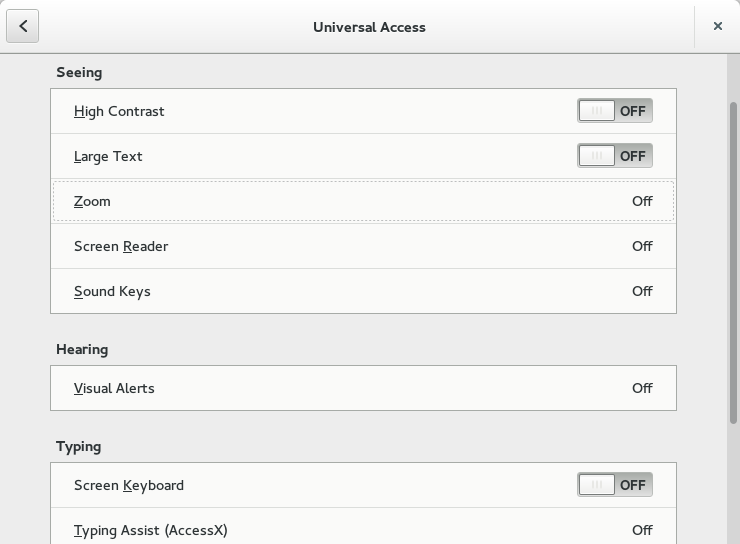 Clicking on an already setup device will bring up the properties, allowing you to connect to the device if necessary, or link to related preferences. Finally, the biggest part of the work was making sure that the new setup mechanism worked at least as well as the stand-alone wizard. This means that I got 17 of my most representative devices out, and set up every single one of them. Edge case. There's a good chance that we'll make some additional, minor, adjustments to the wording, spacing and behaviour of this panel before the GNOME 3.12 release. I'd particularly like to make clicking on a device connect to it if already setup and offer some other way of accessing properties. 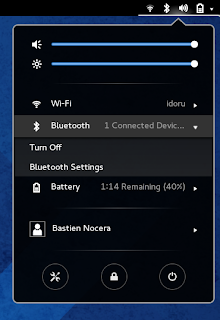 As you might remember, GNOME 3.10 switched to using BlueZ 5.x as its Bluetooth backend. Switching to BlueZ 5.x meant that the old obex-data-server (which was used in both the gvfs ObexFTP backend, and gnome-user-share) couldn't be used anymore. The previously stand-alone obexd was to be used. Its API is quite different, and it obviously didn't get much testing apart from its target use case, the single-user phone case. I fixed a number of bugs this week-end, which should make Obex Push server-side (sending files from your phone to your computer) work as expected. - Ship and apply this (not yet upstreamed) patch if you don't have a systemd-based session, so that obexd can be started via D-Bus. - And ship this patch to have obexd write to the user's cache dir by default. With both of those patches to BlueZ and gnome-user-share 3.10.1, you should be golden. 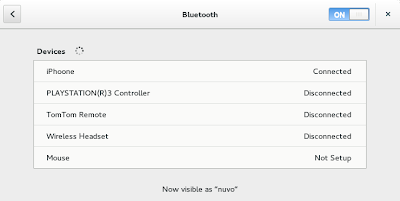 Note that the first patch is also required if you want to send files using bluetooth-sendto. You'll notice that we didn't mention ObexFTP yet, but we'll do, one last time. ObexFTP support client side hasn't seen any updates for a couple of years, and the server side support for it in obexd didn't match our expectations (such as the inability to kill existing, already made connections). So ObexFTP support was never finished porting and re-enabled in gnome-user-share. And given that apart from computers and very few phones, the client side support was lacking, we decided to kill the support for it in gnome-user-share. ObexPush server support is fixed in gnome-user-share 3.10.1, and ObexFTP server support is gone. While doing work on UPower, trying to reduce its wake-ups when idle, I realised that a couple of applications on my desktop were waking up far more than should be necessary. First, we need to detect wake-ups. This is a fairly well-known, and old, process, using the venerable PowerTop. You can increase the number of seconds to get a more realistic view of your machine's idleness, but this is enough to show the main culprits. In my case, evolution, gnote and devhelp were all waking up about 30 times a second whilst mostly idle. Evolution might be an outlier, as it also talks to the network, and is a bigger application to debug, so I started with devhelp. And the screen fills up with EAGAIN errors. This looks a lot like a a timeout being called too often. I started sprinkling debug in g_main_context_prepare(), the function that prepares the various timeout and idle sources for dispatch, and calculates the timeouts for each poll() operation. The problem is we end up getting a null source name for almost all of the sources. This is where g_source_set_name() and its sibling g_source_set_name_by_id() come in handy. And we start doing that all over GTK+. As you can see from the patches in the bug, there's not just timeouts added by g_timeout_add() that we need to name. even when the window doesn't change, is in the background, and not updating. About 30 times a second. Or by whom have you been called, rather. This is a small section of my ~/.gdbinit which will break on a particular function, print a backtrace, and continue. It makes it easier to interact with the logs after the fact, especially if they are calls that happen often and you're not interested in all the calls. We did the same for gdk_frame_clock_begin_updating and found a backtrace similar to the one in Bugzilla. We only needed to start reading some code after that, and figuring out what was going on. The result was a bug in GTK+, likely a regression from GTK+ 3.8. Your laptop should last a bit longer when the updates hit. Name your timeouts with g_source_set_name_by_id(), run powertop, and file bugs against broken applications. 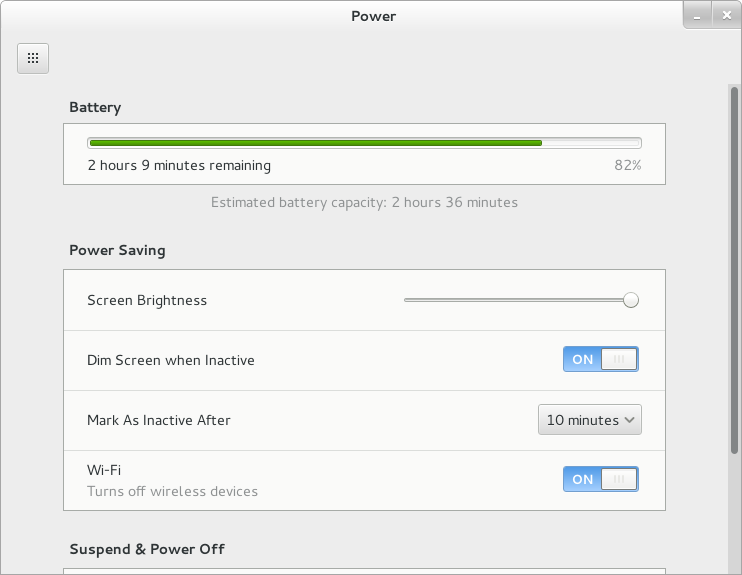 As is becoming common, we will have some more power management changes in GNOME 3.12, though those changes will also affect other desktops, whether they use UPower's D-Bus interface, or libupower-glib, the helper library. All those changes are now in UPower master ready for testing. The deprecated interfaces for Suspend, Hibernate, etc. are finally removed, after being obsoleted by logind. 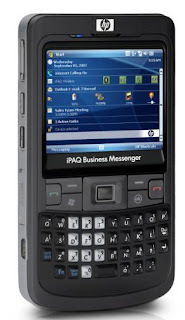 We've also removed the QoS interface that nobody was using, and the out-dated battery recall support. It's not that batteries don't explode any more, it's that they don't all come from known-bad batches. 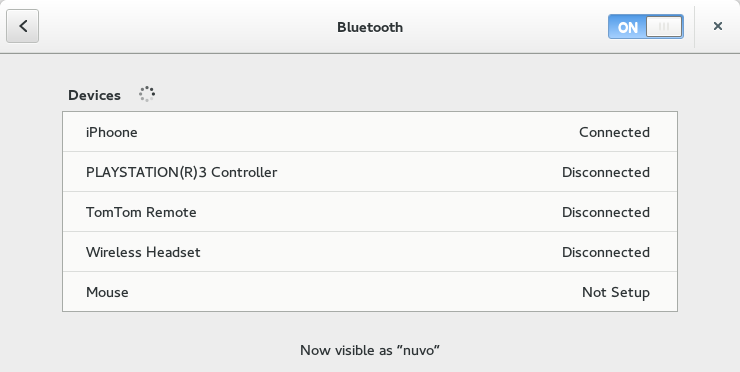 We have 2 new properties on each of the devices. WarningLevel which uses daemon-side configurations to tell you whether a device's battery level is low, critically low, or whether we're about to take action on that critical level. We also have IconName, which replaces some cut'n'pasted code between desktop components. If your desktop environment has many more icons for all types of devices on low battery, for example, you can ignore this property and use the code you always have. Using those new properties usefully is the new DisplayDevice object. It groups all the batteries and UPSes in the daemon into one, easy to use object that you can use to display a single status icon in your shell chrome. Obviously, if you want to show more devices, the individual batteries and UPSes are still available through the usual means. And it obviously has the 2 new properties mentioned above, so your session daemon can get told when to show notifications for low batteries. And finally, using that new combined DisplayDevice is the critical battery action policies. As mentioned above, multi-user systems could not hibernate without requiring the user to enter an administrator password, which is less than convenient when your machine is running out of UPS power fast. The configuration for that policy is now in the daemon itself, with sane defaults, and it will hibernate the machine for you. 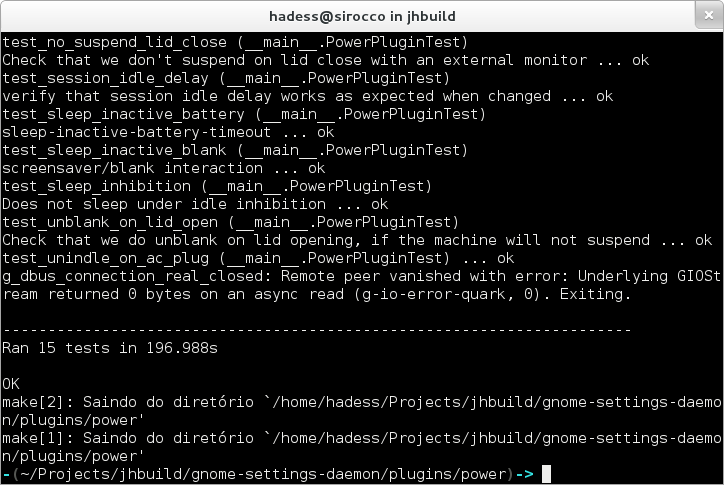 libupower-glib now uses GDBus, even if the daemon doesn't. The daemon however sends PropertiesChanged signals which means that modern D-Bus bindings will automatically get the new values for properties, instead of polling the daemon. The DeviceChanged and Changed signals have thus been removed. They are numerous, too many to mention here. I've posted to the device-kit mailing-list with a list of changes that were made, reply there if you have any questions regarding using UPower in your application or session daemons. 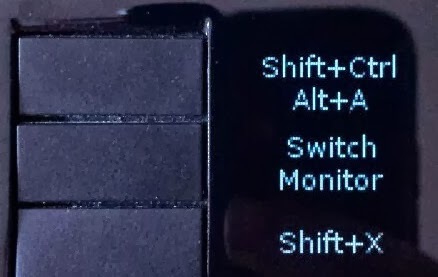 systemd >= 207 will save your brightness settings across reboots, and the upcoming systemd 209 will have support for saving keyboard backlight across reboots. I've made attempts at supporting Intel Rapid Start in systemd, but this will actually require kernel changes. Hopefully we should be able to land this by the time GNOME 3.12 is released. The new release is coming! As has been the case for the past couple of releases, I've mostly been shepherding great work by other contributors, and I'll detail my limited contributions beyond mere bug fixing. I've done some work on enabling clutter-gtk applications to be able to run on Wayland though the harder work of implementing sub-surfaces is still pending. Giovanni has done incredible work on mutter to start moving some of the X11 dependent code inside the compositor, which should allow you to run a (cut down) Wayland session using gnome-shell. This also means that Thomas Wood's redesigned Displays panel has Wayland support. 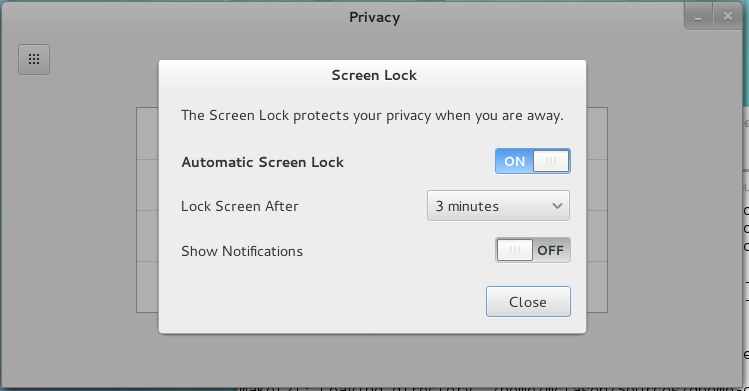 A perfect storm of changes for one of the only panels that received little attention since the GNOME 2.x days. Zeeshan, through his work on Geoclue2, and Kalev, through his Summer of Code project, have completely redesigned the Date & Time panel. 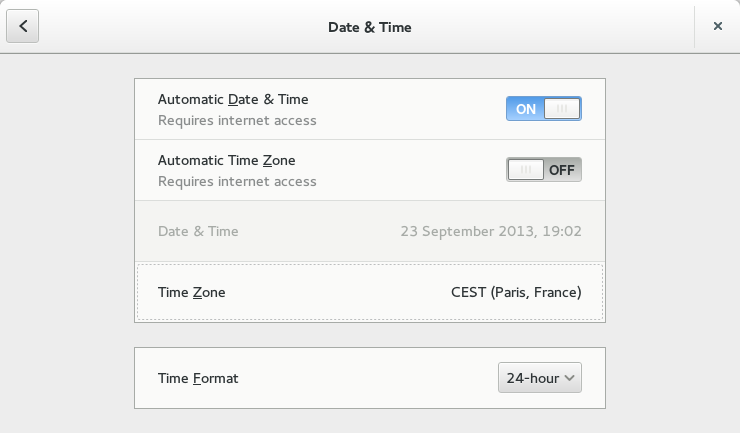 Aside from being easier to setup, it means that we can finally implement the automatic timezone switching depending on your location. GNOME is the first major desktop to ship with BlueZ 5 support, thanks to work by Gustavo Padovan and Emilio Pozuelo Monfort. The older version was not supported anymore, and the new version allows us to support things like "Just Works" pairing, better support of audio devices (though the PulseAudio 5.x release to support this is only coming shortly after GNOME 3.10) and a much better architecture for a more stable operation. GNOME 3.12 should see a redesigned Bluetooth panel, to match current best practices on other platforms (such as merging the management and pairing wizard UIs into one). OLED support for Wacom Intuos 4 tablets (as seen above, thanks Przemo), media keys support for MPRIS applications such as Spotify (thanks to Michael Wood and Lars Uebernickel), updated UI for the Universal Access panel (the ever present Matthias Clasen), support for many more fingerprint readers in libfprint (thanks Vasily Khoruzhick). On top of which you'll find the usual mix of bug fixes, small features, itch scratching, and swamp-draining in finger-pointing fests. I also spent quite a bit of time on a side project that didn't come to fruition at this time, but I hope to be able to post some details soon. 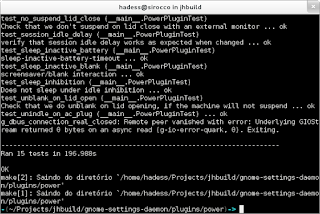 Fabiano Fidêncio will be working on integrating the GStreamer plugin for it upstream, and making sure that the default experience with those devices is good in Fedora. The less powerful 70012 card is now in my 6-year old Dell laptop to test Fabiano's work. The 3G modem that's been ousted from the Dell laptop to make room for the CrystalHD will go to Aleksander Morgado, in his "torture chamber" (his words) for ModemManager. The iPod is going to Adam Reviczky who's going to look into Notes syncing over IMAP (hopefully, it looks like the device might be too old) and for mobile website testing. More thumbnailer work, as it's something I can do 20 minutes of, and then go and do something else. As my thumbnailers were starting to get samey (either the code would spit out PNG/JPEG data, or would create an actual GdkPixbuf), I've created a skeleton file that handles most of the dirty work. It's available on github. 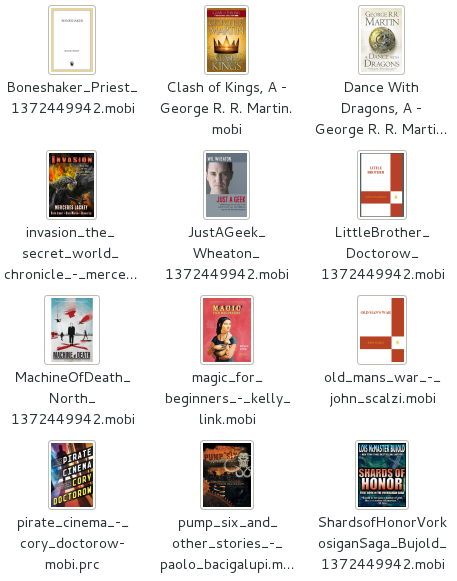 I've also created a MOBI thumbnailer, that's integrated to gnome-epub-thumbnailer and in release 1.2. I'm cleaning up my hardware chest, and giving away some hardware to a good home. I intend on travelling with those that I found a new home for at GUADEC. All of them are in good working condition. If there is a charger or power supply, it will be a UK one. Drop me a mail with your intended usage (preferably GNOME or kernel related), or need some more info about the devices. 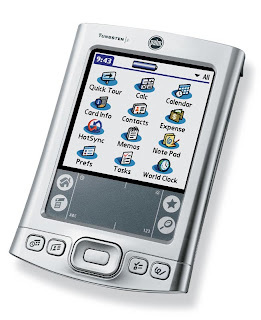 The predecessor to all your new-fangled smartphones. 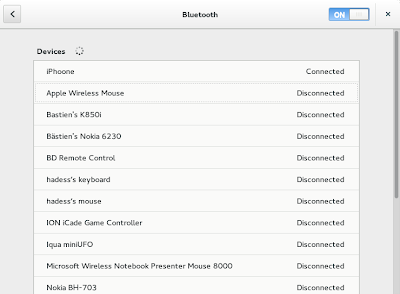 This one could even do Bluetooth syncing using gnome-pilot, all those years ago. Might be nice as a remote control of some sort, or legacy support for Pilots. Works with DD-WRT. 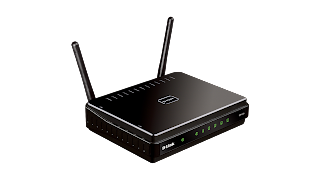 Would be great to work with DD-WRT or associated on a way to configure those through a GNOME UI à-la Airport base stations. Euro plug. Apparently this can't run Linux... Yet! Offload your MPEG2 decoding to this PCI card. Too old to run any recent iOS, but good enough to show off your web apps skills, or work on Notes sync with IMAP servers. 2 video decoder cards usable with Linux. You'd need to port the GStreamer plugin to GStreamer 1.0 to get those (or one of those at least). Not the newest devices, but they work. USB to Nokia/Motorola with this retractable extension lead. Space-age mouse and keyboard set. Benjamin Tissoires will be getting the (now not so much space age as grubby and outdated) pack to hopefully implement HID++ 1.0 in the kernel. The diNovo keyboard is a nice little Bluetooth keyboard for a media PC or the likes, even has the tiniest of trackpads. Hans de Goede will get those to make them work out-of-the-box in Fedora, and upstream, trying to clean up some hacks he gave me for those a long time ago. For Zeeshan, just in case he gets bored implementing geoclue2. For Dan Williams. ModemManager's testing gear is growing. Giovanni and Jasper will enjoy those Wi-Fi dongles that will create bugs in gnome-shell's network menu and the new aggregate menu. : I made my pre-selection based on the possible uses for the hardware. Little birdy tells me that we're playing football again this year, so don't forget to sign up! 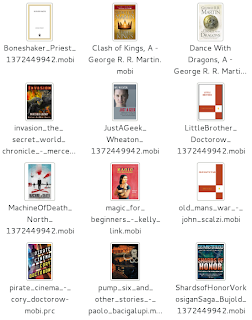 Last week, I picked up a Kobo Mini e-reader from my local FNAC store for (less than) 40€ and loaded it up with books from the latest Humble eBook Bundle. As generic document icons aren't really that great to recognise the books, I wrote a small thumbnailer for it, which is now available in GNOME git. The release is available on the GNOME FTP site, and somebody packaging it up for Fedora would be greatly appreciated. The other week-end hack was a way to run a program with user-defined DNS servers, rather than relying on the system's /etc/resolv.conf file. It only supports IPv4, but it was good enough to run a few command-line utilities with those specific DNS servers. Over the past couple of months, Satabdi has been working during her Outreach Program for Women on geocode-glib, and Zeeshan more recently joined us to help with cleaning up some of the code. As Satabdi's program is now finished (though not her involvement! ), and a new GNOME development cycle has started, I'll try to explain where geocode-glib fits in, and answer some questions on the future of Geoclue. First and foremost, geocode-glib is a geocoding and reverse geocoding library. It uses Yahoo! web services for this, though we're investigating using Nominatim for this in the future. This replaces the convoluted implementations for those two services in geoclue (3 if you include Address as a service). The API should be mostly stable now, and we'll soon start porting a few applications to it (Evolution and Empathy come to mind). The library also includes a GeocodeLocation object. This will be useful later. 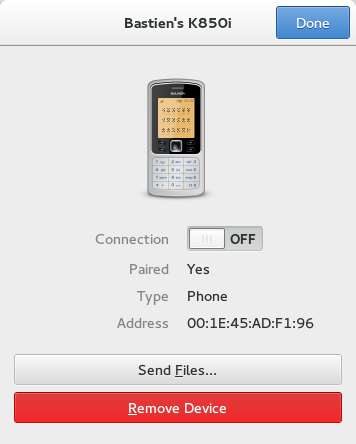 geocode-glib, thanks to Satabdi's work, includes a GeoIP server, to be installed on GNOME servers eventually, which uses data from MaxMind to locate a user connected to the Internet from the IP address. We also have a client library to access this server. 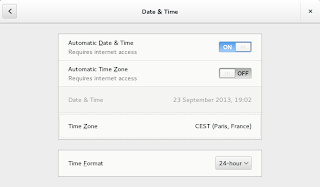 This is usually good enough to locate a user in a city, or a country, which would help us with many integration points in GNOME, such as the upcoming Date and Time panel re-design. But this code isn't really for you, app developers. A fine project, but the codebase is showing its age (dbus-glib! ), and the decision, well, not to take decisions on which backends to use for various services make it fragile. This is a maintenance problem, both for in terms of making sure all the services are kept working, and that geoclue itself is kept stable. and finally, privacy, where only applications that you allow to request your location can get it, and only with an accuracy as needed for the application. The code currently in geocode-glib for IP geocoding will likely move there when the project has been kickstarted. I hope this clears any misconceptions people might have about geocode-glib, or, more likely, about the future of geoclue. Office Runner 1.0 is now available, downloadable at the usual location. We had some pretty good comments on the original announcement, even though some people took this opportunity to start slinging insults, which is pretty uncool. There's plenty of related power management work that's been happening in preparation of GNOME 3.8, and we're mostly waiting on GNOME Shell changes to land before I can talk to you about those. 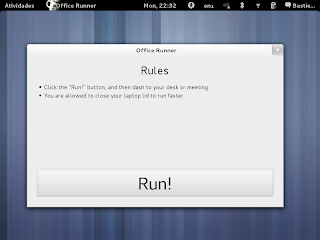 I hope it gets the same (positive) comments as Office Runner did, though I imagine some people will get angry about changes, as they are wont to do. This version requires systemd for the suspend inhibition.